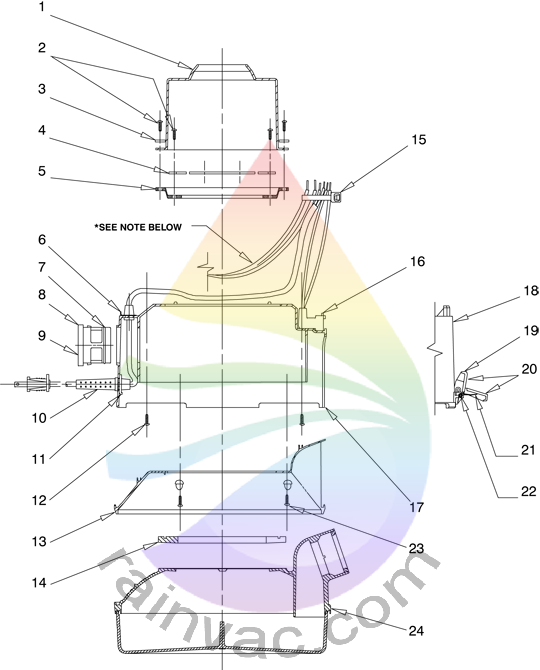 This schematic covers the complete Rainbow D4 (SE) main housing assembly that includes the main power cord, exhaust cover, latches, and motor gasket. Cooling fan shroud for the D4C SE (Special Edition) and D4C model Rainbow. This item helps keep any debris from getting into the armature and carbon brush area. Effective serial number 6476946, this shroud eliminated two R2172 outer clamps. A raised boss was added to the four screw holes to allow for proper attachment. Outer motor mount clamp to hold the motor mount and shroud to main housing. Inner motor mount clamp to hold the motor support to the motor on the D4C SE (Special Edition) and D4C. This large rubber motor mounting ring screws to the main housing and motor base while supporting the motor on the model D4C SE (Special Edition) and D4C model Rainbows. Strain relief clip for on top of the main housing on the D4C SE (Special Edition) and D4C model Rainbow vacuum. Factory original OEM main electric cord for the model D4C SE (Special Edition) and D4C Rainbow. Over the years, the strain relief where to cord goes into the main housing can break causing a short, the new power cords have been improved to help prevent this issue. Baffle plate for the D4C SE (Special Edition) and D4C Rainbow. This item is on the bottom of the unit that is held in place by four screws. You need to remove the R2702 gasket first before you can remove this part. Factory OEM original motor gasket for the model D4C SE (Special Edition) and D4C Rainbow. This gasket can get hard and crack overtime reducing the systems performance. 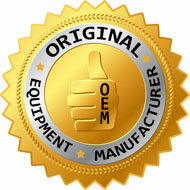 During a repair, replace this item if you feel your existing gasket is compromised or damaged. We recommend GOOP adhesive to seal this gasket to the main unit. Latch the water pan on when finished for about 30 minutes to allow the glue to dry. Automotive GOOP®, Household GOOP® and Plumbing GOOP® are all the same formula. Power Nozzle receptacle for the model D4 SE (Special Edition) and D4 Rainbow. If your power nozzle cord falls out easily, a replacement of this part will fix the issue. Main housing for the D4C SE (Special Edition) and D4C model Rainbow. If your latch has broken the mounts on your main housing, you will need to replace it with this part. Applique for the D4C SE (Special Edition) model Rainbow main housing. Pre-cut for the latch area and exhaust cover port. Item does NOT include spring or pin. Please look under the "Related Items" tab. Easily replace your broken latch (clasp, fastener) for all versions of the D4C SE (Special Edition), D4C, D3C, and D3A Rainbow. Use a small punch and hammer to remove the brass pin holding in place. The pin has a smooth side and a rough side. The rough side bites into the plastic to hold the pin in place. Punch the pin from the smooth side to remove. This item is only available in black because the factory Rexair, LLC no longer makes color matching latches for the D3C or D3A. They also no longer make decal matching latches for the D4C (Special Edition) or the D4C. Item numbers R4228, R3833, R2815, R2814, R2622, R1565, R1562, and R1561 are listed on some older latches. This item is the direct factory replacement. Latch applique for the D4C SE (Special Edition) Rainbow vacuum. The new latches no longer have an applique on them so this is only needed for older latches. Original factory latch spring for the D4 model Rainbow vacuum. This spring helps keep the latch up out of the way when you remove the Rainbow from the water pan. Prevents latch from falling back down and catching the water pan lip when lifting up Rainbow from the water pan. These pins can become bent or rusted. Easily replace with a small punch and hammer.